Dr. Johnnie W. Jones, Jr.
“I am 92 years old. 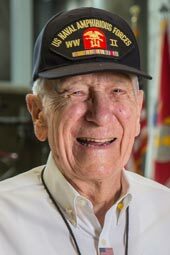 On June 16, 2016, at age 92, Bowdre McDowell served his 1,000th volunteer hour at the National WWII Museum in New Orleans. A veteran of the war’s Pacific Theater, McDowell was 89 when he was recruited as a volunteer. He just had to fit it into his already busy schedule. But he knew it was important. Earlier experience talking with schoolchildren at the museum gave McDowell a first-hand understanding of the educational value of connecting kids with veterans. The art of communication has fascinated McDowell for the greater part of a century. As a young man, intrigued by coded language, he mastered Morse code, learned to read ticker tape, and then, how to break Japanese coded messages for the war effort. After the war, McDowell pursued a degree in marketing—not so much to sell things, but out of curiosity about people and what motivates them. But what motivates Bowdre McDowell? What drives him to hop on the streetcar, get to the museum and work for free? He’ll tell you he does it out of loyalty and love of country. Deep down, what really pushes him is an irrepressible energy and a constant desire to see what comes next, to meet new people and to make friends out of strangers. A lifetime of travel and curiosity have given McDowell the capacity to see the world from the perspectives of others. His experience allows him to read people better than ever before; to instantly connect with people on first meeting them; and to make them feel like old friends. At the museum, this translates into a personalized education experience for each visitor. He knows not all will gain a better understanding of the war, but some will. It’s important that they do. And that is why it’s important to greet every person he sees coming through those museum doors—in order to leave a lasting impression of this stirring piece of history. Bowdre McDowell … Peoples Health Champion. Peoples Health is a Medicare Advantage organization with a Medicare contract to offer HMO plans. Enrollment depends on annual Medicare contract renewal. If you have questions about the Peoples Health Champions program, call toll-free (877) 712-7320, Monday through Friday, from 8 a.m. to 5 p.m. Telephone device for the hearing impaired users may call (888) 631-9979.